We've been buying and selling online for over 20 years, as well as advising others on how to do the same. These days, we aren’t usually surprised or excited by something we’ve ordered, and an aspect like the packaging rarely ever catches our attention (unless it's memorably awful!). That’s why what just happened to us was so special. Recently, spurred on by a coupon we had received, we ordered from a vendor with whom we hadn't done business in a while: Vitacost, which sells healthy snacks, vitamins, teas, and other organic health and grocery products. (We'll confess that the promise of a decent discount is what inspired us to give them another shot!) When the package arrived and we opened it up, we actually said, out loud, “WOW!” The packaging was simply amazing. The box had two separate compartments—one for fragile items, and the other for less fragile ones. The fragile items were individually wrapped and cushioned, something we hadn’t seen before. The branding on the outside of the box was so well done that we actually wanted to read what it said, rather than just tear it open and get to our stuff. The company so impressed us we decided to interview Jay Topper, Vitacost's CIO, CTO, and Director of Customer Service. Our interview follows. Please tell us about the boxes you use for shipping. Let's start with what's printed on the outside. The box we saw was certainly well-branded. What thinking goes behind how you brand your boxes? Topper: The customer is at the core of everything we do, including the design of our box. We printed our promise on the box not just once, but twice—because it is foundational! “Love your shopping experience or we’ll make things right” is the first thing you see after opening the box. We want customers to know and believe we will do whatever it takes to make sure their experience is not just a positive one, but one they love. The URL on the box leads to our online service center, where customers can process an instant free refund, order an instant replacement, or find other services they need both pre- and post-sale. On the outside of the box we wanted to show off our new logo, which embodies our brand’s new, naturally-rooted look and feel. We also wanted to make a special call-out to the carefully selected, eco-friendly packaging materials we use to protect our customers’ items. And last but not least, we included a call for customers to snap and share pictures of their products on social media, because we believe everyone has the potential to motivate someone else to live a healthier life. We want customers to know and believe we will dowhatever it takes to make sure their experience is not just a positive one, but one they love. How about the paper and other materials you use for cushioning contents? How would you describe the materials you use? There was paper, yes, but also some unusual packing materials. Topper: We strive to use materials that are either recyclable, compostable, or—and this is especially important with items that are neither, like plastic bags—reusable. The only exceptions are the clear tape on the bottom of our boxes and the tape we use to seal bottles to prevent leakage—and we’re working on rectifying that as well. Vitacost cares about our environment, and our customer base does too. It’s a triple win: it gives comfort to our customers, our associates, and the world at large. Your customers must appreciate the eco-friendliness of your supplies. Do they reuse them? Topper: Yes. Many customers reuse the packing supplies, and they do recycle them as well. They use the boxes for storage, and the Geami paper (that funky, die-cut paper we use in place of bubble wrap) works well for reuse if a need to pack fragile items for storage or moving arises. Our latest e-magazine had a craft idea for reusing Geami and old K-cups to make tiny, decorative planters. We have had customers tell us they use our boxes for litter boxes, play forts, craft supplies, or even for kindling in cold weather. During the holidays, the boxes get reused more than once for transport—they’re pretty sturdy! I personally use my boxes as mini-recycling bins in my home. My wife and I like the large box to collect cans and bottles—it’s far less gaudy than the big plastic ones! This makes it a much more personal—or rather, human—experience, and the associates take pride in being that final stop before shipment. Have other customers praised your packaging? Do you find it to be a selling point for your business? Topper: Every day, customers acknowledge and thank us for using recyclable material in our packing and being aware of the impact that our packaging has on the environment. Packing in general is a difference-maker for Vitacost. About a year ago we went to what we call “pack complete” in our fulfillment centers. Every box is hand-packed and sealed by a packer. We cap it off by adding the packer’s name to every invoice—and each packer can choose at the start of the shift the message they want on the packing slip. This makes it a much more personal—or rather, human—experience, and the associates take pride in being that final stop before shipment. In addition, we get daily feedback from customers praising the individual associate who packed their order, which we then share with the packer. 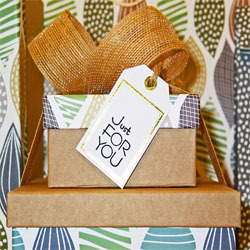 We LOVE packaging as a strategic driver of our business! What else should our readers know about your company and especially packaging and shipping? Topper: Well, know this (if it wasn’t clear already): we love our customers! People want and need the human touch—and we need it, too. It’s a wonderful approach to advance not just the business, but to better enable customers’ healthy living journeys. As for packaging and shipping, we continually work to get packages to customers faster and cheaper, without a loss of quality. We want to ensure clear and transparent communications about orders and shipping so customers have accurate expectations. Pleasant comfortable packaging really can give customers a good mood!